Right now, along with some of the other guys from the Lucky Gunner team, I am preparing for another round of our self-defense ammo ballistic gelatin testing. This time, we’re going to be testing a few dozen .38 special and .357 magnum loads and we’re planning to have those results ready for you guys to see early next year. While we’re doing the actual testing over the next few weeks, we might not be able to put out as many videos and blog posts and we would like. So I apologize in advance if we’re a little light on content, but we’ve got some really interesting stuff in the works and it is definitely going to be worth the wait. In the meantime, today I want to give a little background on just one of the rounds that we’re going to be testing and that is the lead wadcutter, also called a full wadcutter. A couple of years ago, I did a short video about what a wadcutter bullet is, but I didn’t offer much detail on using the wadcutter as a self-defense round. If you didn’t catch that earlier video, a wadcutter is a roughly cylinder-shaped bullet that is designed to be used in revolvers. Wadcutters are seated in the case so that the face of the bullet is flush with the case mouth. These were originally intended for bullseye type competition because the wadcutters leave a clean, round hole in a paper targets making them easier to score. They are also typically loaded to travel at relatively low velocities, so they have very little recoil compared to just about any other centerfire handgun load. So, why anyone would want to use a non-expanding, slow-moving bullet for self-defense? Well, the low recoil is usually what attracts people to that option. 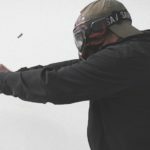 A small alloy-framed snub nose might be painful for somebody to shoot with conventional self-defense ammo, but with wadcutters, they can become very manageable. 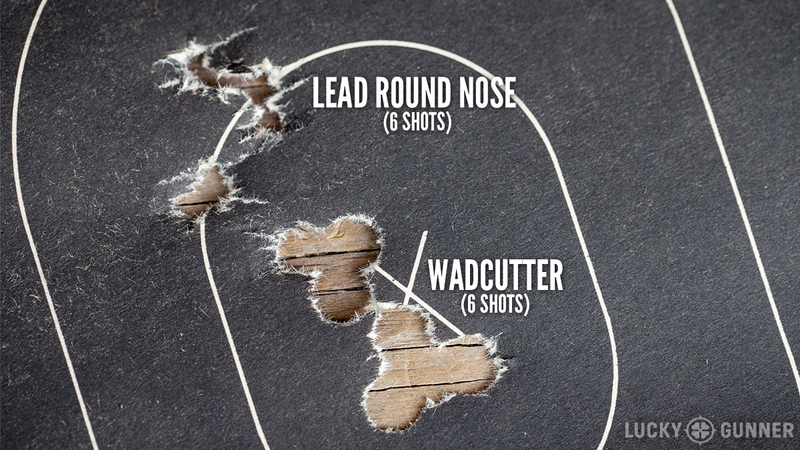 Even more experienced shooters using a steel frame revolver will typically find that they can get accurate follow-up shots much quicker with wadcutters than with most other loads. 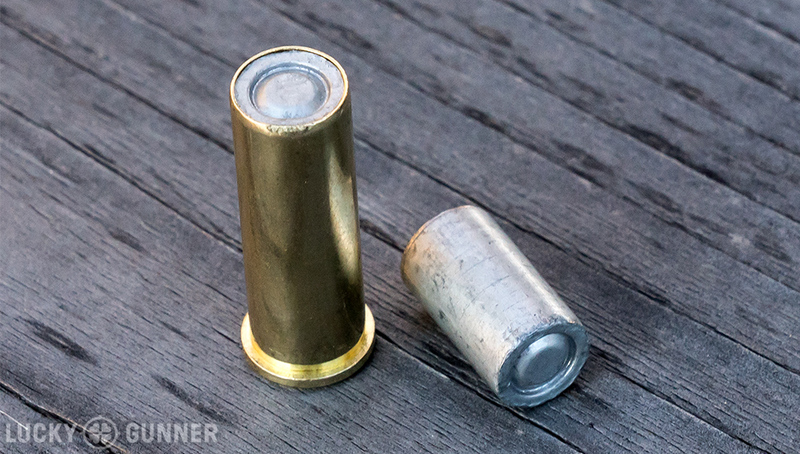 Wadcutters also have the potential for surprisingly effective wound ballistics out of a small revolver compared to conventional self-defense ammo. 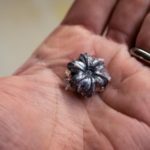 Most hollow-points will only expand if they get up to a certain velocity, and sometimes the little 2-inch snubby barrels don’t launch those bullets fast enough to reach that velocity. When a hollow point fails to expand in soft tissue, it basically acts like a round nose or full metal jacket. It makes a hole, but it kind of pushes its way through tissue like the hull of a boat moving through the water. It doesn’t create a large wound channel and it just isn’t as effective at stopping threats when it doesn’t expand. A wadcutter, on the other hand, because of the flat front and hard right angle, it does to soft tissue kind of what it does to paper — it punches a sharp hole that’s a lot more disruptive than a round nose. Even though the wadcutter doesn’t actually expand, it tends to penetrate soft tissue very reliably. Penetration is really the most important thing we want to see in a good self-defense round, so when you combine that with light recoil, a .38 special wadcutter is actually a pretty formidable self-defense round. The catch is that most snub nose revolvers have fixed sights and sometimes wadcutters are going to hit a few inches higher or lower than what the sights are regulated for. Also, thanks to their shape, it’s difficult to reload with wadcutters in any kind of hurry. A lot of guys that load their carry gun with wadcutters will use something different for their reload, like a speed strip with Gold Dots, for example. Most major ammo manufacturers produce some kind of 148 grain .38 special wadcutter load but they can have pretty drastically different velocities from one brand to the next. I did some chronograph testing with wadcutters from six different ammo makers and took the average velocity of 10 shots fired from a 2-inch barreled revolver. The Winchester load was the fastest at a little over 700 feet per second. The Federal, Remington, and Magtech loads were within 50 feet per second of that and then there’s a big jump down to the Sellier and Bellot load at close to 600 and then another massive decrease to 530 for the Fiocchi load. So there’s nearly a 180 foot per second spread between these six loads — that’s a 25% decrease in velocity from the fastest load to the slowest. All of these loads still have very mild recoil, but if I was choosing one for self-defense, I would want one of the faster loads out of this batch just to make sure I get that penetration we’re looking for. The Winchester, Federal, or Remington would all be good choices. The Magtech velocity is also decent, but Magtech ammo tends to have tough primers which can lead to light primer strikes in some revolvers. 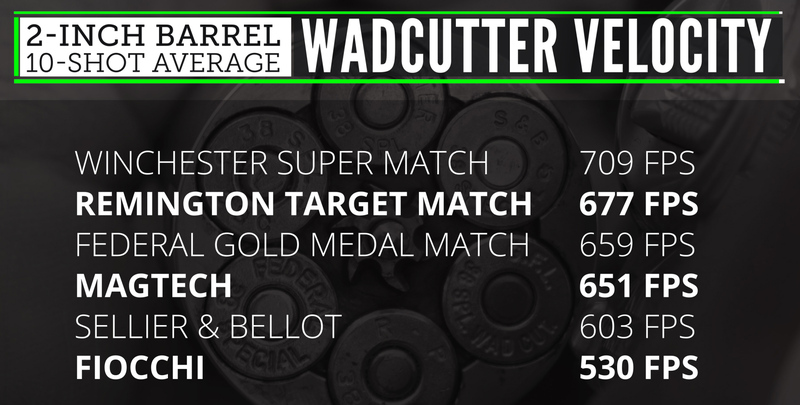 You can find much higher velocity wadcutter loads from some of the smaller boutique ammo companies, but you start running into diminishing returns with those. When you get up to numbers like 850 feet per second with a wadcutter, there’s no real increase in performance over the more standard loads but you do end up with snappier recoil, so it’s not really worth the trade-off. We’re going to be using the Winchester wadcutter in our gelatin tests, so we’ll see how that compares to the jacketed hollow-point loads. 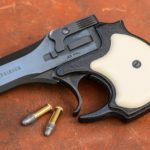 But even if some of those hollow points expand out of a 2-inch barrel, none of them are going to be as easy to shoot as the wadcutter, so for recoil sensitive shooters and super lightweight revolvers, do not overlook the humble lead wadcutter load. If you want more of that sweet revolver goodness, be sure to check out the archives of our Wheel Gun Wednesday series!